Here's Sgt Peppers Lonely Hearts Club Band as you've never seen them before... with The Teenage Mutant Ninja Turtles leading a merry group of action figures. Graphic artist Elliot Chinnock was commissioned by creative agency Purple Revolver to re-create The Beatles’ iconic album cover for Liverpool International Music Festival in it's first year, back in 2103. Elliot spent a fortnight plotting the best replacement characters from the world of comic culture to make the new piece called Sgt Peppers Plastic Hearts Club Band. Pop artist Peter Blake used life size cardboard cutouts to shoot the iconic 1967 cover, which features famous faces including Marlon Brando, Oscar Wilde and Adolf Hitler. Liverpool-born Elliot, 22, said: "The biggest challenge was choosing suitable substitutes for the original. "The first ones to nail down were the Sgt Peppers characters. Looking at all famous quartets in the comic world, The Teenage Mutant Ninja Turtles leapt out at me. "The Turtles are my favourite foursome from childhood and the colours of the Peppers costumes match the distinctive colours of the different turtles, which sealed the deal. "As for the grey suited Beatles from their early days, it was easy to go with the Ghostbusters. Another legendary fab four and their uniformed look blends well with the Mop-top era Beatles. "The Sgt Peppers base drum is one of the most important features of Blake’s cover; so it needed something equally as iconic from the comic book universe to replace it. "Captain America’s shield is so striking, even my Nan could tell you what it is." 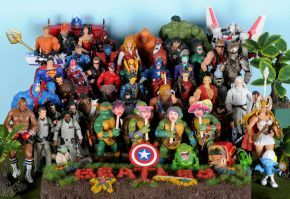 Elliot has been collecting action figures ‘with passion’ for five years, but has also kept all his toys from being a nipper and described how each figure holds a special meaning for him. He added: "The project was stressful at times, just trying to get the figures to stand up was a nightmare. They fell victim to the domino effect countless times during dress rehearsals. "James Dean was switched for Ghost Rider for their similar love of motorcycles and Gandhi replaces Gandalf because of their similarities in name and character." You can see Sgt Peppers Plastic Hearts Club Band at Purple Revolver's Art Gallery at the Albert Dock’s Grand Hall until September 22nd.